What is Vittles Vault Plus? 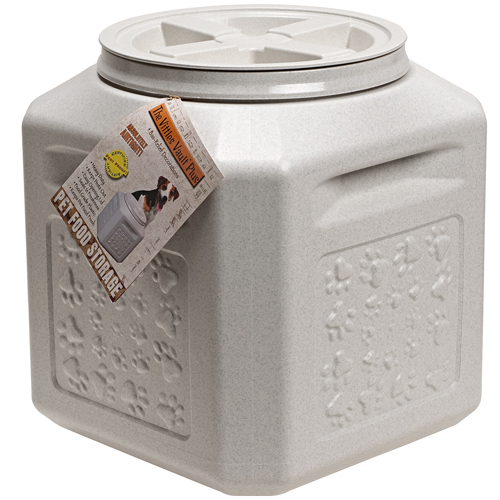 The Vittles Vault Plus Pet Food Container is an easy and decorative way to store your dog's or cat's dry food or kibble. Stylish paw print decorations are embossed on the sides (25 lbs and 35 lbs containers only), and all containers have a granite stone look made from FDA-approved high-density polyethylene plastic (HDPE) free of BPA. The easy spin-open, spin-close lid locks tight to prevent pet food from spoiling while also keeping ants and other insects out. Plus, each container includes a measuring cup for accurate feeding! Available in 3 storage capacity sizes (15 lbs, 25 lbs and 35 lbs). Unlike some plastic containers which may be made from reprocessed plastic, Vittles Vault Plus Pet Food Containers are made with the same food grade plastic (FDA-approved high-density polyethylene plastic) used throughout the human food industry to ensure the utmost quality. The double gasket seals used to seal in flavor and freshness are made from FDA-grade styrene butadiene rubber (SBR), and are lightly lubricated with an FDA-grade silicone. 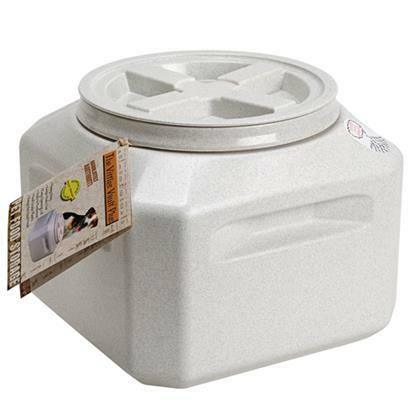 Clean the Vittles Vault Plus Pet Food Container before its first use. Dry food or kibble for dogs/puppies and cats/kittens. See Details tab for dimensions and food storage capacity. The Vittles Vault Plus Pet Food Container should be cleaned out and allowed to thoroughly dry before its first use and periodically thereafter. 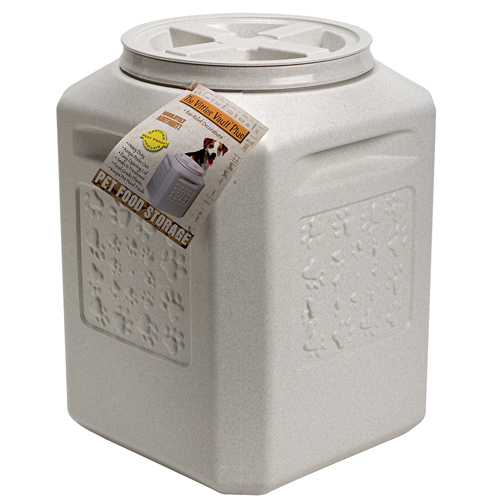 The fill capacity for each Vittles Vault Plus depends upon the kibble size of your pet's dry food. Since dog food kibble was used to determine the fill capacity, there may be more or less room depending upon your pet's dry food or kibble size.